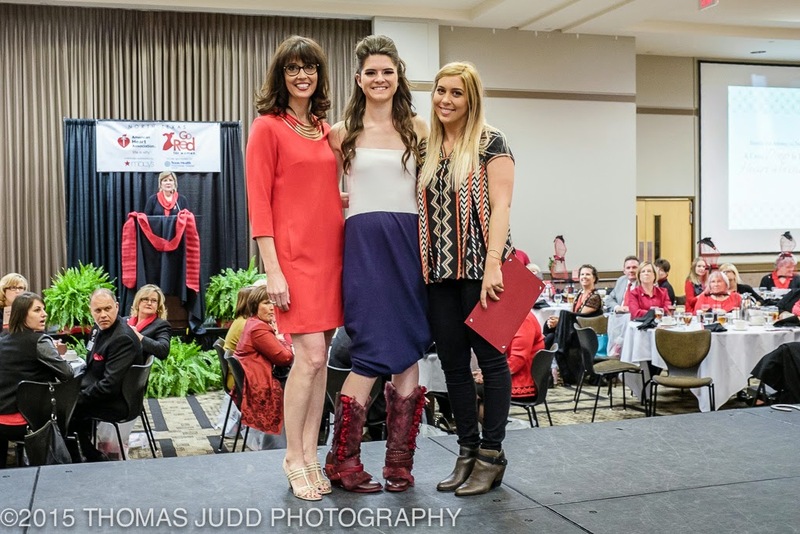 Congratulations to senior student, Sarah Thompson, for receiving the Accessory award in the 2015 Go Red Luncheon/Style Show on February 13, 2015, at UNT Gateway Center. UNT Fashion Design students exhibited fifteen dresses and fourteen accessories. Student designers were Isabel Acosta, Carina Alcantar, Sofia Arevalo, Shira Artis, Jiani Chen, Shelby Echevarria, Alexandra Ells, Jenna Elsik, Morgan Emmert, Alexandria Essex, Erika Falk, Stephanie Gabel, R'Bonney Gabriel, Lee Hansen, Cathy Holle, Ashley Jensen, Memory Jora, Hee jun Kang, Alison Jones, Jasmine Kelly, Carisa Lafleur, Victoria Lin, Matthew Porter, Maria Romero, Celeste Salazar, Angela Smith, Sarah Thompson, and Joanna Thornton. In addition, special thanks to Jiani Chen, Cathy Holle, Jasmine Kelly, Maria Romero for the volunteering and Kala Bennett and R'Bonney Gabriel for the modeling.